Piramal Glass Ceylon PLC is urging the Government to reduce furnace oil prices similar to petrol and diesel if it is sincere in encouraging more exports. “We regret to note that the relevant authorities have reduced the prices of petrol and diesel but have not addressed the price of furnace oil price inspite of drastic reduction of international crude oil prices,” Piramal Glass said in a statement. “Our continuous appeals to the authorities has gone unheard, heavily impacting the company profitability and sustainability of exports,” it added. Piramal said that it is very concerning to note the mixed approaches of the authorities towards exports. “Much focus is made on exports, by encouraging the business to promote their products, yet the Government does not create a conducive environment for same by creating a level playing field,” it said. “Whilst all neighbouring countries have linked the furnace oil price to the global crude oil rates, we regret to note that we in Sri Lanka are yet to implement same,” it added. 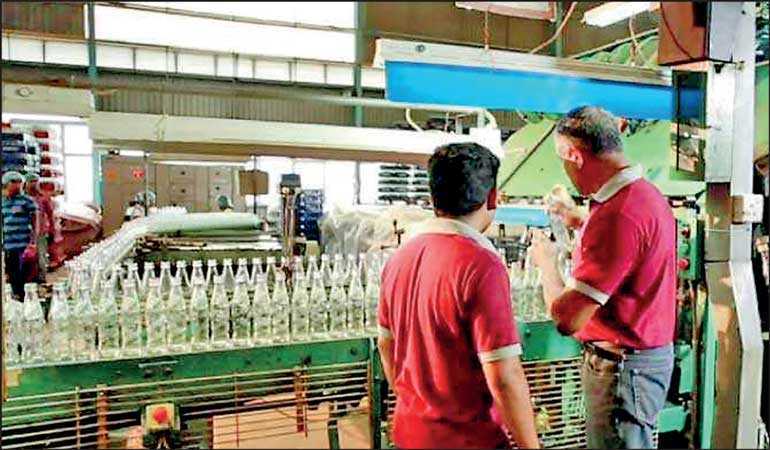 Piramal Glass said it is continuously developing new bottle designs and markets for exports and accordingly investing in high tech infrastructure. “Our efforts has resulted to increased presence in the developed markets such as USA, Canada, Australia, etc. Current investment in infrastructure is to the tune of Rs. 1.35 billion which is mainly to cater international demand,” the company said. It said the Government’s decisions to increase certain levies and taxes has impacted in the final products becoming more expensive. “This has resulted in the consumer shifting towards cheaper and illicit products. This turn of events has impacted several manufacturing industries including packaging. Thus we feel this decision has neither benefited the industry nor added any additional revenue to the Government. If these events continue, the fate of domestic industry would be a question mark,” warned Piramal. During the third quarter ended 31 December 2018, Piramal’s export sale amounted to Rs. 733 million, marginally up from Rs. 729 million a year earlier. In the first nine months exports grew by 31% to Rs. 2.12 billion.For the nine months ended 31 December 2018, the company’s gross profit margin has decreased from 21% to 16% as compared with previous year similar period. The gross profit during the period under review was severely impacted by the fuel price increase to the extent of 35% in LPG and 15% in furnace oil which in turn has directly impacted the prices of raw material, packing material and transportation costs. Profit after tax for nine months of FY19 declined by 38.6% to Rs. 154 million. See Page 3 for the full story. The turnover for nine months at Rs. 5,485 million showed an 8% growth as against the previous year sale of Rs. 5,067 million. The export sales grew by 31% from Rs. 1,627 million to 2,123 million whilst a drop of 3% was seen in the domestic market from Rs. 3,440 million in F18 to Rs. 3,362 million in F19. The 3rd Quarter ending 31 December 2018, has always been a very positive quarter for domestic sale each year due to the festival season. Yet these positive sentiments were not seen this year especially due to the unstable political climate in the country and the uncertainty towards the polices. The domestic sale of F19 Q3 was Rs. 1,226 million as against Rs. 1,256 million of F18 Q3 which showed a drop of 3%. Food, beverage and liquor segments continued to show a de-growth during the quarter as well as for the nine-month period when compared with the similar periods of the previous financial year.